Chemical folded sorbents are one of the most versatile environmental safety products available. Chemical sorbent applications range from maintenance to spill management. Perforations can customize the length. Sorbent can be unfolded into pads or pillows. Folded Sorbent is dispensed in the form of a 5 inch wide continuous roll, perforated every 16 inches. Tearing at the perforations can customize the length needed, can be unfolded into pads or pillows. Applications range from maintenance to spill response. 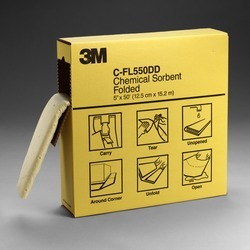 Folded sorbent is 5 inches X 50 feet (10.5 gallons/50 foot section).